Are you ready to sign up for a cruise? If so, this page is full of helpful information and a good place to start. a) FAQ Travel Planning: There is lots of information here about what the trip will be like. b) Are you unsure which cruises is best for you - the four night or the six night? A good place to begin is with our page Two Amazon Cruises. It's easy to plan a trip! Just take a look at this Cruise Planner and if you have questions, just give us a call or send a message. We will be pleased also to send you a copy by email, just please go to our Request Brochure page. Our you can send us an email to reservations(at)naturetours.com, or just give us a call! Tel: (001)-401-423-3377 / 800-688-1822. We look forward to offering you a wonderful experience in the greatest wildnerness on earth. a) Please give us the travelers names as they appear on their passports. b) Are you traveling as double or single occupancy? If a single, are you willing to share a stateroom? e) Would you like a city tour of the City of Manaus after the cruise? This brief 3.5 hour tour starts early so that you can still fly out the same day. Manaus is a city with a fascinating history, elegant 19th Century architecture, and a strong character of the rawness of the great forest that surrounds it. Well worth seeing! 2) Discounts for Children: On regular departures children who are 12 years old and under who share a room with an adult are eligible for a discount of 50% off the Cruise Rate, subject to availability. 3) Family Departures: All of our trips are family friendly, when we have children on board we try to do a little extra for them! We have a page describing ways in which we endeavor to keep young people entertained: Family Travel in the Amazon. 4) Stateroom Categories: All of the staterooms on the M/Y Tucano are outside staterooms with large windows, private baths with showers and air-conditioning. There are three categories, named after the colors of Brasil: Yellow Category, Blue Category, and Green Category. Yellow Category: The five staterooms in this category are large and have beds side by side. They are numbered 3, 4, 5, 6, and “0”. On request the individual beds can be joined to make a single queen sized bed. Staterooms number “0” has a queen size bed beside a single bed, is a comfortable space, but unlike the other staterooms, it has a very small bathroom. Blue Category: The two staterooms in this category are singles with a single size bed, private bath, and air-conditioning. These are numbered 1 and 8. 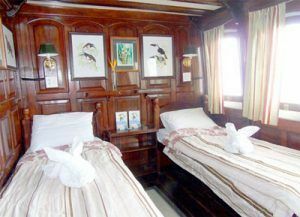 Green Category: The two staterooms in this category have above and below berths (bunk beds). These are numbered 2 and 7. These staterooms are significantly smaller than those in the Yellow Category. They are nonetheless comfortable outside staterooms with large windows, private bathrooms, and air-conditioning. 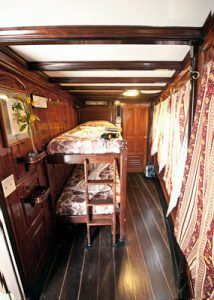 Triple Accommodations: Stateroom “0” has a queen size bed and also a single bed which can be helpful for families. Also staterooms “3” and “4” can be converted to triple occupancy where a third narrow bed can be placed between the single beds, which is helpful for families with small children. In the case of triple occupancy, each traveler pays the Green Category Rate. 5) Hotel Nights: We strongly recommend that passengers spend one night in Manaus, Brasil prior to the cruise. On our six night expedition cruise, Voyage to the Heart of the Amazon, embarkation is early in the morning on Day One so a hotel night is required. A hotel night prior to the cruise The Amazon Odyssey is not absolutely necessary, but is recommended because it offers a chance for travelers to relax prior to the cruise. On request, we can book reservations at a variety of hotels in Manaus for our travelers. Please get in touch with us for additional information. 6) Airport Transfers: At your request and at additional expense we can have a transfer van and a guide at the airport waiting for you on your arrival. Rates can vary and we will be pleased to quote these for you at your request. Sometimes transfers can include other travelers on the same cruise. It is easy also in Manaus to simply take a taxi to your hotel. It's up to you. 7) Optional City Tour of Manaus: A 3.5 hour tour of Manaus is available the Friday that our cruises end. The tour consists of a visit to the oldest square in Manaus, the Praça Dom Pedro ll, the boisterous Mercado Municipal, and the Teatro Amazonas, the famed Opera House of the Amazon. Included are the services of an English speaking guide, entrance fees, and transportation to and from the meeting place on the Ponta Negra area of the city, the Hotel Tropical. Please keep in mind that most museums are government operated and may be closed according to unpredictable public service schedules. Most are closed on Sundays and holidays. a) When a traveler reserves a space on a cruise, we ask for a non-refundable deposit in the amount of $300 dollars. This can be paid by personal check or in most circumstances can be charged to your credit card on our PayPal account. Please note that this deposit necessary to guarantee a space on our expeditions and is entirely non-refundable. On receipt of the deposit we send by email or if desired postal mail a Confirmation Kit which includes the pre-departure booklet “Expedition Notes”, which provides a great deal of helpful information for preparing for and enjoying the cruise. b) The second step is that travelers complete forms included with Expedition Notes called the Preference Memo and Trip Application. The Preference Memo will indicate if you wish us to provide additional services in Manaus such as airport transfers, hotel reservations, and participation in our city tour. These choices can also be discussed with us by telephone at 800-688-1822.
c) Arrangements Confirmed: When all the parts of the expedition are confirmed, we will send a final invoice. Full payment is due 60 days prior to departure. 9) Payment and Cancellations Policies: Each reservation must be guaranteed with a $300 non-refundable deposit. Payment can be made by agency check, bank check, money order, wire transfer, or in most circumstances can be charged to your credit card via our PayPal account. Any cancellations must be made in writing. If cancellation is received 61 days prior to the departure date payments will be fully refunded except the $300 deposit per passenger. For cancellations between 60 and 45 days before departure, fifty percent of the total trip cost will be refunded. Less than 45 days before departure, no refund of any payments will be able to be made. Failure to secure a valid passport, visa, or air arrangements does not waive this refund policy. Inability to operate other side trips, or schedule changes with side trips, or flight schedule changes do not waive the refund policy. Refund policies are subject to change without notice. We are not responsible for errors of emissions. 10) Airline Connections: The city from where the cruises begin and end, Manaus, Brasil, is the most readily accessible city in the Amazon. There are many flights from the large cities within Brasil and some international flights that originate in the USA, Europe, and other countries in South America. The airport code is MAO. European Travelers: Most travelers from Europe will arrive in Manaus via connecting flights from São Paulo or Rio de Janeiro, Brasil. There are many international carriers flying through these Brasilian gateways with connecting flights to Manaus. United States Travelers: There are three air carriers with direct service to Manaus, Brasil from the United States. a) American Airlines: This carrier operates daily non-stop direct flights from Miami, Florida to Manaus, Brasil. b) TAM Brazilian Airlines: This carrier operates daily non-stop direct flights from Miami, Florida to Manaus, Brasil. c) COPA Airlines: This carrier has flights to Manaus connecting in Panama City. Connecting flights originate in New York, Miami, and Los Angeles in the USA and many major cities in Latin America. Flights from other countries in South America: There are several flights weekly from other countries in South America which can help in creating a flight itinerary that includes several destinations. There are several weekly flights to Manaus from on TAM Airlines from Caracas, Venezuela, and flights on COPA from Panama City which connect well with flights from Peru or Ecuador. 11) Visas: Most travelers with European passports do not need tourist visas to enter Brasil. Citizens of Canada and the United States are required to secure a tourist visa. Information about securing a visa is included in our pre-departure booklet, Expedition Notes. 12) Electricity and Conservation: The electrical system on board the M/Y Tucano is 110 volt/ 60 cycle alternating current. The wall plugs are the two blade type commonly used in North America and Mexico. In the interests of conservation, in the morning and for a short time in the afternoon we have "solar power hours" during which we do not operate the diesel generators and other noise making machinery - to include the ship's air-conditioning system. During this time for lighting and water heating as well as some other critical ship's functions, we use only solar power. This is a good time to appreciate the wonderful stillness of the wilderness and the subtle natural sounds of the forest. See the section below, Sustainability as well as a more detailed description on the page Sustainable Travel in the Amazon. 13) Sustainability: In many ways our cruise operations and the vessel M/Y Tucano itself are designed to conduct sustainable tourism and to minimize the environmental impact of our cruises. The basic areas on which we focus are energy conservation, waste management, and pollution control. In the realm of energy conservation we have equipment and procedures in place to conserve energy while at the same time retaining the comfort of our cruises. The M/Y Tucano has two solar power systems, a photovoltaic system to generate electrical energy, and a direct, active solar system to heat water. The solar generated electricity is used to power our galley refrigeration, our ice makers, cold water dispensers, some lighting, and, importantly, energizes the batteries that we use to propel our ship's launches on excursions. The solar water system is one of two entirely separate water circulation systems on the M/Y Tucano, the other is powered by diesel electric generators. The vessel throughout is designed to support both systems. Each of the bathrooms on the M/Y Tucano actually has two shower heads: one of them for gravity fed water heated by our solar collectors and the other pressurized hot water powered by fossil fuel, our diesel generators. Operationally we have a variety of ship's procedures to promote energy conservation. First, we have a policy of “solar power hours” when we actually turn off all diesel consuming machines for certain hours of the day when they are not needed. This is done in the early morning and late afternoon when the boat is generally at anchor and most travelers are not on board the ship. The vessel remains comfortable even without electrical generation because it was designed to offer water, illumination, and climate control even without diesel generators operating. Because the M/Y Tucano has two completely separate water systems, even when there are no generators functioning the refrigeration, sinks, toilets and showers on the vessel continue to function. Another conservation measure that we employ, one that has been widely adopted world-wide in accommodations industry, is that, unless requested by travelers, we change the stateroom linens on board the vessel only every other day instead of every day. This reduces the energy consumed in washing what are usually still clean linens. Of course, linen changes are available on traveler request. The M/Y Tucano was designed with large windows so that travelers are able to use natural lighting during the day. This mostly eliminates the need to generate power for illumination during the day and is a significant reduction of fuel consumption. All but a very few of the light bulbs on the vessel are LED bulbs which greatly reduces power consumed. When it comes to climate control, the M/Y Tucano has an efficient air-conditioning system that functions in the heat of the day and at night. 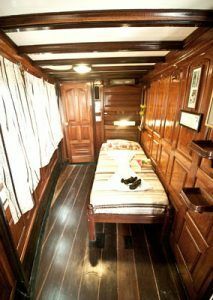 But even during the solar power hours, the staterooms stay cool because the vessel is thermally well insulated. Almost all of the windows on the vessel open and close and we have a practice of opening the windows in the public spaces in the cool of the afternoon. Many travelers choose to turn off the air-conditioning for the duration of the trip. Together, all of these measures enable us to greatly reduce fuel consumption and emission of pollutants. The ship design, mechanical equipment, and the extensive conservation have helped make the Motor Yacht Tucano the most sustainable expedition vessel in the entire Amazon.